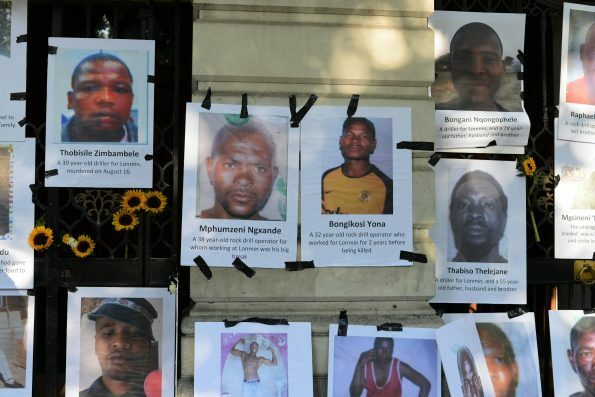 On August 16 2012, over 100 workers on strike for a living wage at Lonmin platinum mine in Marikana, a small town near Pretoria, were shot by the South African police, killing 34. This was the single most lethal use of force against civilians since the massacre of students during the Soweto uprising in 1976 under the apartheid regime. Lonmin, a London-based mining corporation founded as Lonrho in 1909 during Cecil Rhodes’s brutal white supremacist occupation of Zimbabwe, is at the centre of this violent extraction of Africa’s natural resources, responsible for urging the police to use force to suppress the miners’ demands for basic rights, safety and dignity. Since the massacre, Lonmin has been complicit in processes of intimidation, criminalisation and incarceration of miners and their families, with many still imprisoned for their actions during the strike while impunity reigns for the corporation’s criminal executives. Lonmin has delayed its AGM because it is on the verge of being taken over by Sibanye-Stillwater, a multinational with one of the worst records on worker fatalities and environmental degradation in the South African mining industry. Thousands of jobs are threatened, the loss of which would have a devastating effect on already impoverished communities. The workers and community in Marikana are worried that when Lonmin disappears as an entity, no-one will be held accountable for its crimes against them and their environment. With London as the hub of global mining, and the banks in the City showing no brief except to maximise their profits, it is up to the pressure of public opinion to make sure that Lonmin is held to account. We appeal not to the City, but to the people of London to act and join frontline communities resisting British mining and financial imperialism in demanding justice and reparations for Marikana, and all African peoples and nature. South African delegates and groups acting in solidarity will be making interventions inside the AGM. Watch this video of last year’s demonstration with interviews from representatives of Marikana community and keep up to date for other actions happening over the course of the day. Amandla! Justice for Marikana: protest the Lonmin AGM!